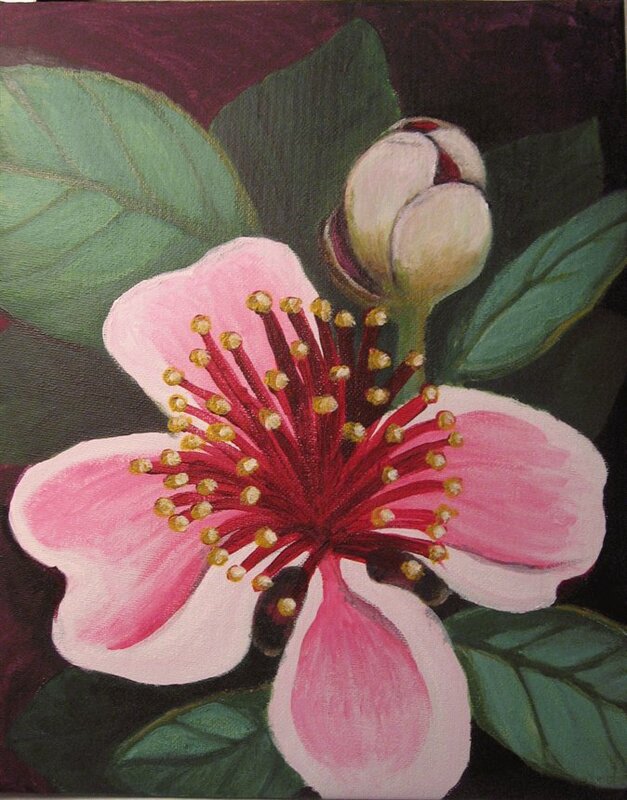 I’m a little obsessed with some of the artworks I discovered for my recent post feijoa art gallery #1, so I’m thrilled to share another series featuring feijoas or their beautiful flowers. Once again, copyright belongs to the artists and publishers – please visit the links for more information and more artworks. Enjoy. Watercolour demonstration using pineapple guava, on Paint Draw Paint. 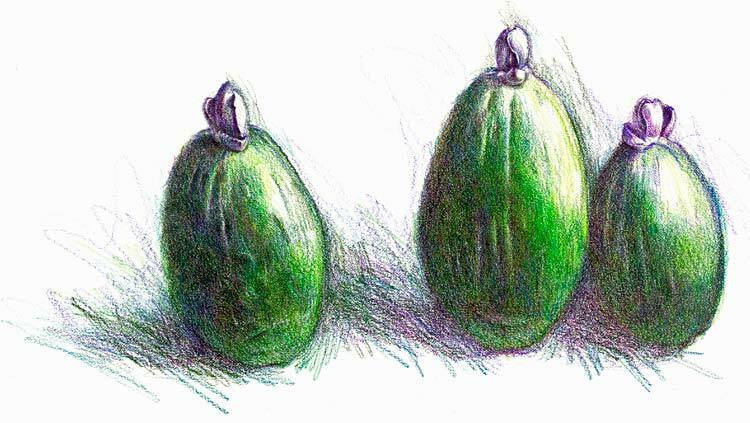 Three Feijoas by Irina Gronborg on West Coast Drawing. 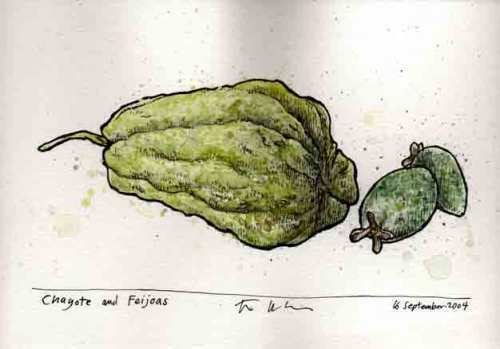 Chayote and Feijoas, ink and watercolour on paper, 2004, by Joe Linton from Handmade Ransom Notes [Joe Linton’s Art Blog]. One of six fruit visuals in a design proposal by Pawel Adamek, UK graphic designer and illustrator. 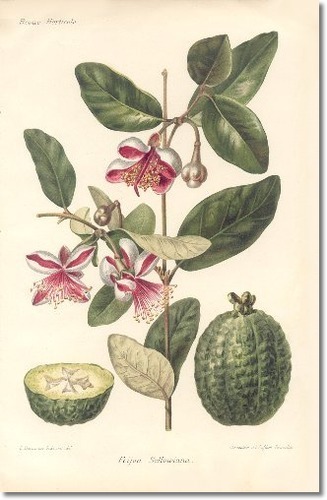 Illustrated Book Plate Illustration from Revue Horticole 1800s – Botanical Print – 11 – PINEAPPLE GUAVA, from Encore Editions Fine Art Prints. 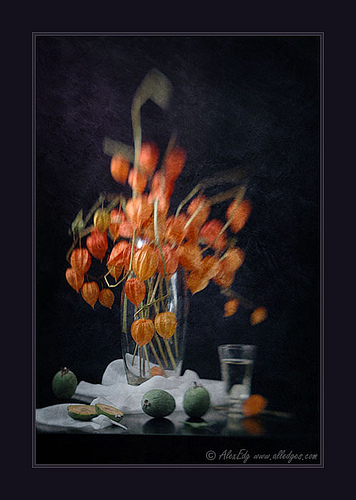 Feijoa & Physalis (Lensbaby 2.0), photograph by Alex Edgar on Flickr. 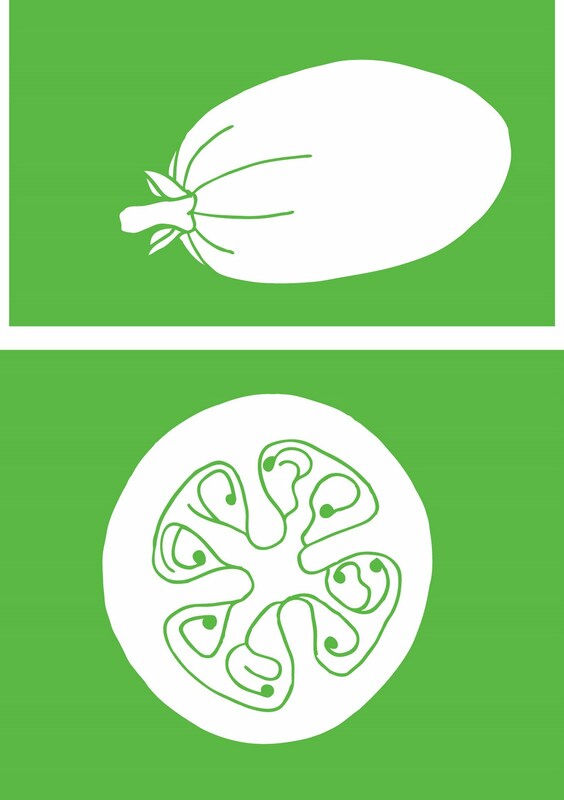 I guess this can be considered a virtual installation – a series of feijoa artworks united only by their subject matter. All copyright remains with the artists, of course. I think a number of these could easily grace my walls. Please visit the links if you like the images – at the time of writing, some still appear to be for sale. 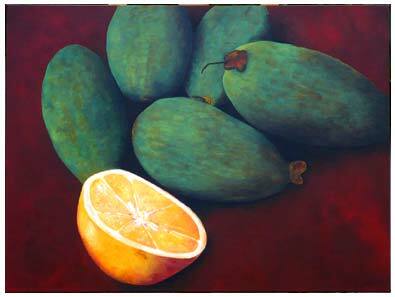 For more feijoa art, check out fejioa art gallery #2. 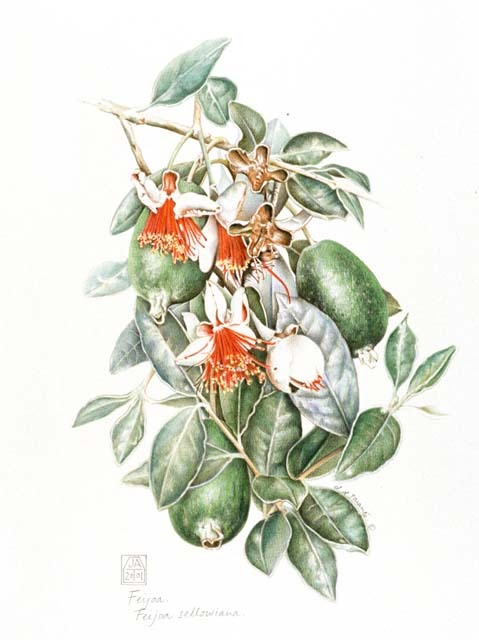 Feijoa Flower by Lyn Gosling. Acrylic. From the website Paintings I Love. Fruit  by Alan Doak. Acrylic. From his website www.thinman.co.nz. 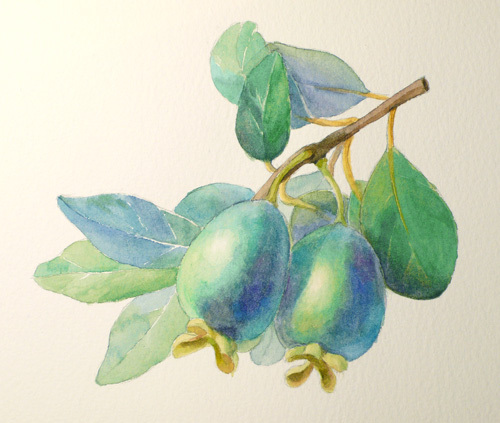 This lovely watercolour and pencil by Jennifer Taranto was selected for exhibit in The Art of Botanical Illustration – Sixth Biennial Exhibition and Sale 2002 by the Melbourne Friends of the Royal Botanical Society. 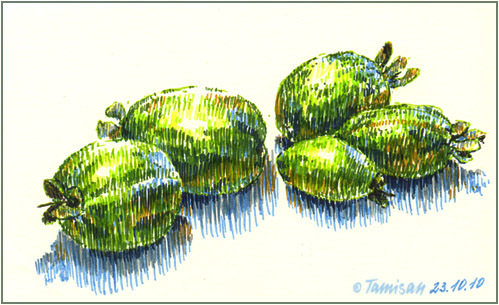 A lovely sketch of feijoas by Tamisan Mio on DeviantART. 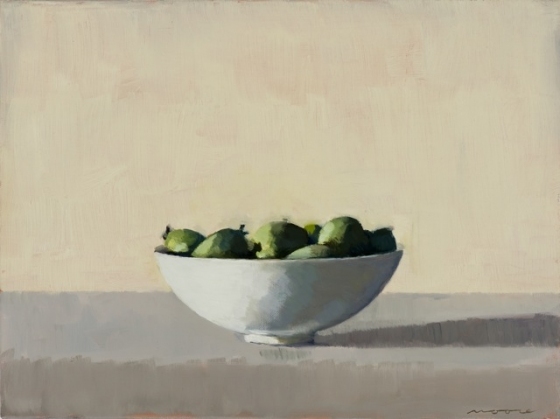 Sliced Feijoa, by Karl Braun, Oil on Jute, 60 x 90cm, from Braun Paintworks. 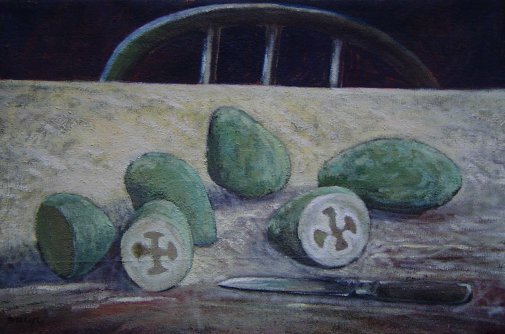 Feijoas by David Moore on Chrysalis. 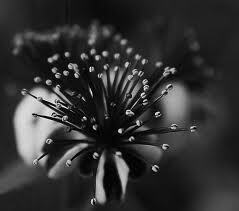 Black and white photograph of the feijoa flower by Martin Sandburg / Swedish Goose on Flickr. There are a lot more so I’ll leave them for a second “gallery” post.